Marin County, CA (Sept. 21, 2017) — LIVE DEAD ‘69 have announced engagements for their triumphant UK return, following their debut in Jan. of this year. The All-Star, legacy ensemble, are set to expand their concept and repertoire for their 2018 tour. Their seven winter shows last February have assumed a certain mythology amongst UK Deadheads … the finale at London’s much regarded Under The Bridge concert venue was sold out and video of the performance has been widely circulated on the web. And, a recent U.S. performance has played all this week on “The Grateful Dead Hour” syndicated radio show. 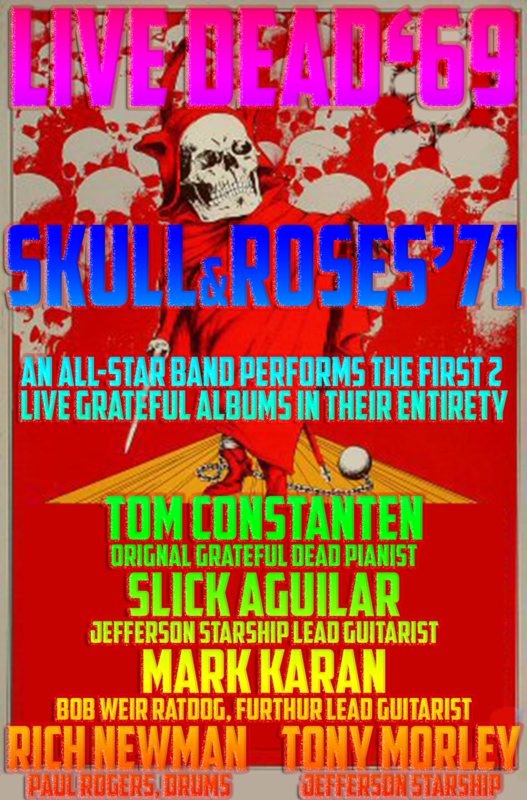 Tom Constanten, original Grateful Dead pianist, who played all the keyboards on the original “Live Dead” recording, inducted into The Rock & Roll Hall of Fame in 1995 and was essential to Grateful Dead’s first 2 ambitious/ experimental studio recordings “Anthem of The Sun” and “Aoxomoxoa.” Mark Karan, lead guitarist with Bob Weir’s Rat Dog and The Other Ones, Slick Aguilar who played lead guitar in Jefferson Starship & KBC for 26 years and with David Crosby Band before that; UK drummer Richard Newman who just recorded Robert Plant’s new single, recently toured with Paul Rodgers, also played in Jefferson Starship, Rory Gallagher, Deb Bonham and many others; and, UK multi-instrumentalist Tony Morley, also of Jefferson Starship – round out the line-up. All are fan favorites, especially in the UK. Live Dead ‘69 shall perform the first 2 live Grateful Dead albums (“Live Dead recorded in 1969, and “Skull & Roses” in 1971) in their entirety, with assorted other selections and truckload of improvisation. Their unique familiarity with Grateful Dead’s halcyon material implies an improvisational prowess that shall be on full display.